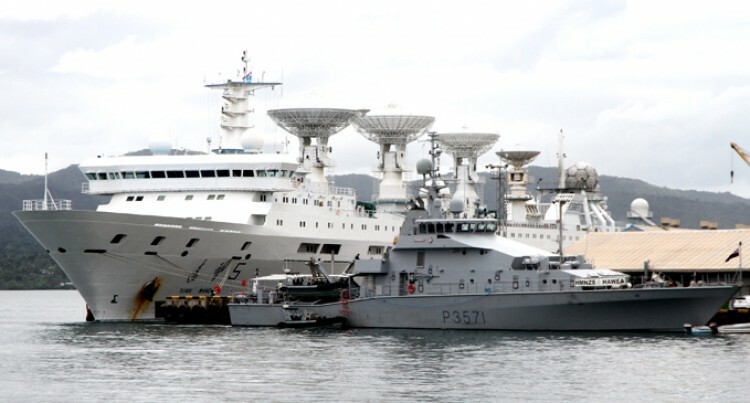 The People’s Republic of China’s tracking vessel Yuan 5 and New Zealand’s Inshore Patrol Vessel HMNZS Hawea are at Suva Port. The NZDF sent Hawea to Fiji in late April to help patrol its territorial water and Exclusive Economic Zone (EEZ) over the next six months. Commander of the Republic of Fiji Navy Captain Humphrey Tawake had earlier told the Fiji Sun that Hawea’s deployment to Fiji was a big help in protecting the South Pacific country’s maritime resources and training its Navy personnel. “The value that the Republic of Fiji Military Forces places on New Zealand assisting us with our maritime security is such that our Prime Minister, who had co-chaired the UN Oceans Conference, mentioned in one of his speeches the work that Hawea is doing” Captain Tawake said. HMNZS Hawea according to Captain Humphrey is currently replacing the RFNS Kikau currently in Australia for refurbishment. Captain Humphrey yesterday said that when the RFNS Kikau returned the RFNS Kula would also go for refurbishment.